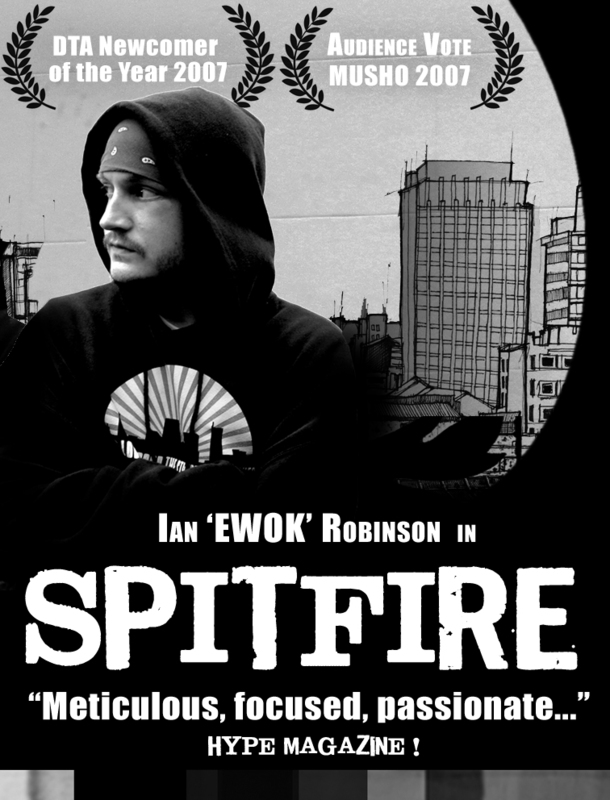 Spitfire | Written and performed by Iain Ewok Robinson. Directed by Libby Allen. Written and performed by Iain Ewok Robinson. Directed by Libby Allen. Do What I Please Productions is the award-winning collaboration between writer, poet, emcee, teacher, actor, musician, artist, community and hip hop activist (sheesh) IAIN EWOK ROBINSON and director, teacher, writer and performer LIBBY ALLEN. Ewok and Libby have worked together since late 2005, when Ewok approached Libby to direct his first one-man hip hop theatre performance, One Mind, One Mouth, One Mic. The piece debuted at PANSA’s Musho! Festival in Durban, 2006, where it received an Audience Choice Award, as well as acknowledgement for bringing new types of audiences into the formal theatre setting. One Mind played at the Standard Bank National Arts Festival in Grahamstown, 2006, and at the Uplands and Cape Town Festivals; as well as travelling to schools throughout KwaZulu-Natal, to Botswana, and to Educators’ Training Days in Durban and Pretoria. During the creation and touring of this production, Ewok and Libby created Poetry off the Page, a performance, writing and self-expression workshop geared toward high school and university students. The workshop, as well as One Mind, One Mouth, One Mic, enjoyed great response at the Standard Bank Regional and National Schools’ Festivals and Kearsney College’s Upbeat Festival. Such is the prolific nature of Ewok’s writing, that Spitfire was created shortly after One Mind, again opening at the Musho! Festival, in 2007. Here, the company was awarded the Audience Choice award for the festival, as well as the Suliman ‘Pick of the Festival’ trophy. Spitfire, like its predecessor, has performed to schools locally and abroad (Uppsala International Poetry Festival, Sweden: 2008), often teamed with the Poetry off the Page workshops. Ewok and Libby have also created and produced BombStyle (Audience Selection: Musho! 2008), in which their style of hip hop theatre took on a different nature with the introduction of Durban actor and comedian, Liam Magner of the Neon Anthems- on stage with Ewok. The piece also featured sound design by DJ Veranda Panda and audio-visual elements by Karen Logan. Spitfire continues to tour locally and abroad … mo’ fire.